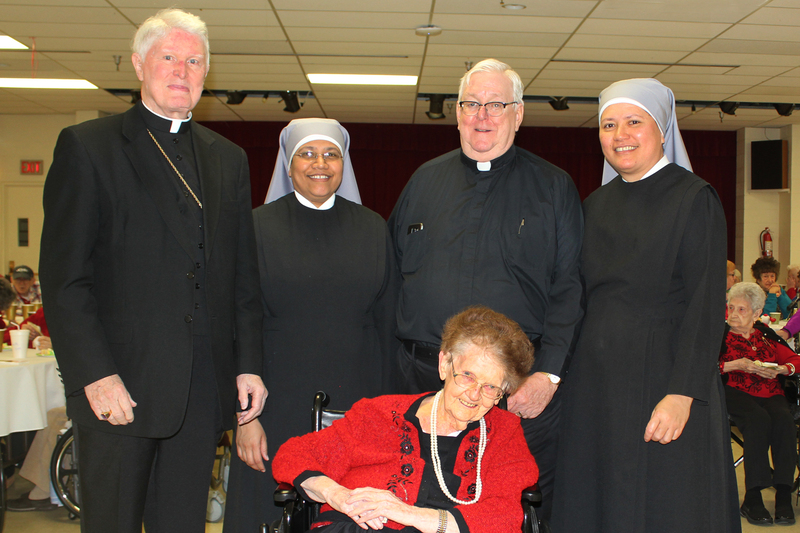 On Monday, March 19, the Little Sisters of the Poor at Holy Family Residence hosted their annual St. Joseph’s Day celebration. The Most Rev. James C. Timlin, D.D., Bishop Emeritus of the Diocese of Scranton, and several diocesan priests, celebrated a special Mass at 10:30 a.m., in the chapel at the residence, 2500 Adams Ave., Scranton. At 11:30 a.m., the priests served lunch and visited the residents. St. Joseph, who is the husband of the Blessed Mother and the foster father of Jesus, is the patron saint of the universal Church as well as the protector of the Little Sisters of the Poor. The Most Rev. James C. Timlin, D.D., Bishop Emeritus of the Diocese of Scranton; Sister Laurelliya, l.s.p. ; the Rev. 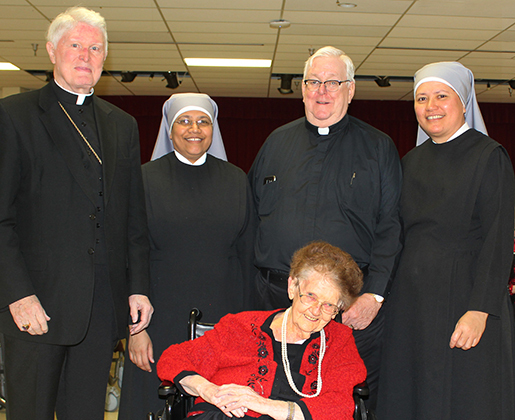 E. Francis Kelly, chaplain of Holy Family Residence; Mother Theresa Louisa, l.s.p., superior of the Little Sisters’ Scranton community; and Resident Loretta Culkin, (seated), pause for a moment during the Little Sisters of the Poor’s annual St. Joseph’s Day celebration.